Community Description: This patchy subalpine to alpine vegetation is dominated by low mat of crowberry (usually black crowberry) and alpine bilberry. Fir, spruce, mountain holly, and/or heart-leaved birch occasionally grow 1-2 m high, but only at low cover (<25%). 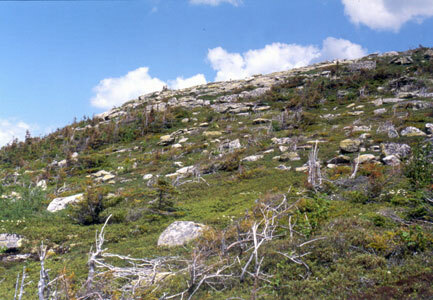 Total vegetation cover is usually 20-50% (excepting crustose lichens), with expanses of rock prominent among the vegetation. Crustose and foliose lichens are abundant on the exposed bedrock. Back to top. Soil and Site Characteristics: Sites are on very exposed bedrock summits or upper mountain slopes at moderate to high elevations (1800’ and up). Typically sites are thin-soiled and well drained. Back to top. 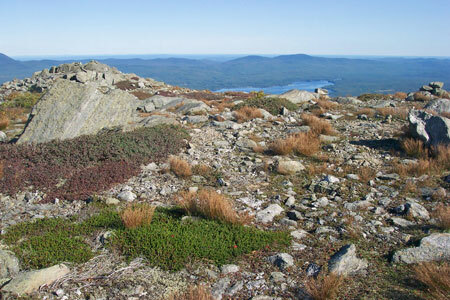 Diagnostics: Sparse and patchy vegetation occurs near or on mountain summits, with crowberry, bilberry, and/or highland rush prominent, and without strictly alpine species such as Bigelow’s sedge, diapensia, Lapland rosebay, etc. Back to top. Similar Types: This type often co-occurs with other alpine or sub-alpine types. Rocky Summit Heath vegetation can occur at similar elevations, but is usually somewhat less exposed, with some tree cover (though stunted) and with typical lower-elevation heath shrubs such as Labrador tea, sheep laurel, black huckleberry, or rhodora. Heath Alpine Ridge occurs at higher elevations and features some strictly alpine species such as Bigelow's sedge, boreal bentgrass, diapensia, etc. Back to top. Conservation, Wildlife and Management Considerations: Most occurrences are on public or private conservation land; however, hiker traffic can cause degradation even on these "protected" lands. 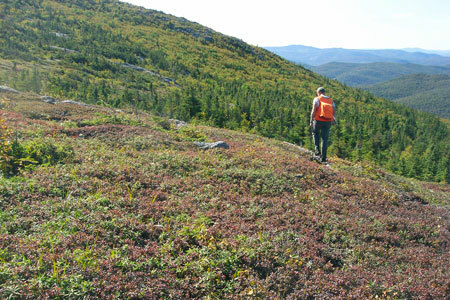 As with all alpine and sub-alpine vegetation in Maine, careful trail siting and efforts to minimize off trail use are the important management considerations. Birds of open habitats and grasslands, such as the savannah sparrow, may use this habitat. The rare crowberry blue butterfly is restricted to coastal heaths in east-coastal Maine. It is typically found in peatlands, where it uses black crowberry as a larval host plant, but could occur in this community as well. Back to top. Distribution: Mid- to upper elevation ridges of Maine's western and central mountains (mostly in the New England - Adirondack Province), extending westward and southward along the Appalachians. Landscape Pattern: Small Patch. Back to top. Caribou - Haystack Mountain, White Mountain Oxford Co.
Mount Coe, Baxter State Park Piscataquis Co.
Moxie Bald Mountain, Appalachian Trail Somerset Co.
South Turner Mountain, Baxter State Park Piscataquis Co.